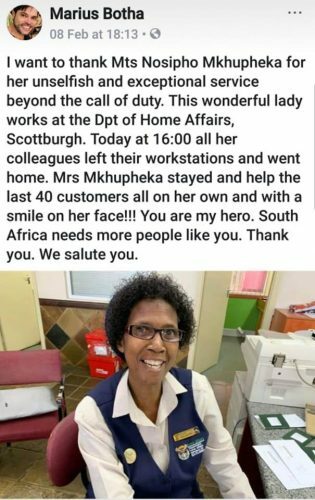 Nosipho Mkhupheka has been lauded after staying on to help customers after all her colleagues went home for the day. A social media user’s recent post highlighted that not all home affairs stories are gloomy and frustrating. 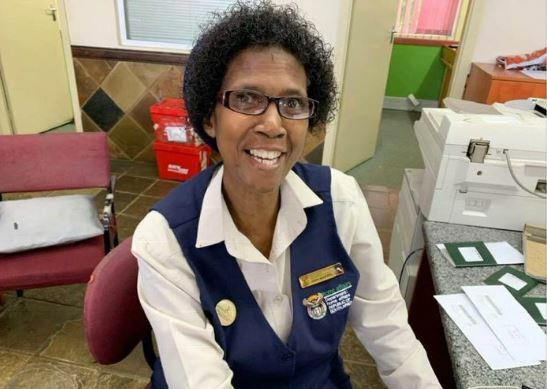 Marius Botha recently posted a tribute to Nosipho Mkhupheka for her “unselfish and exceptional service” after she helped him and many others at the department of home affairs in Scottburg, KwaZulu-Natal. Botha said that Mkhupheka stayed on at work after 4pm, despite the rest of her colleagues leaving work for the day, to assist the remaining customers. This is despite the department declaring earlier this year that their larger offices should be open temporarily from 7am to 7pm, to address the massive backlog of document distribution and registration. His tweet says Mkhupheka helped at least 40 people with a smile on her face. Since Botha’s post, social media users from across the country thanked Mkhupheka, hailing her exceptional work and dedication as embodying the ethos of Batho Pele (People First) principles, which are often lacking in home affairs departments. Had the same experience at Randburg Home Affairs some time back. Office Manager, Mr Herman Lekalakala, personally stayed behind and assisted about 30 of us with document processing. Staff at home affairs have also received flak from the public, and the department has called for a ban on cellphone usage by frontline staff. Home Affairs Minister Suyabonga Cwele also declared earlier this year that the massive ID backlog experienced at the Gauteng home affairs was addressed in four days. Cwele said the department reduced the backlog from 90,000 uncollected documents to just 55,000.